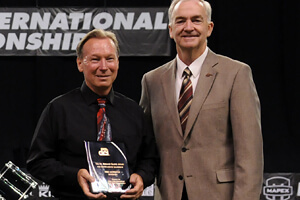 Fred Morrison, executive director of the Crossmen, and Chris Magonigal, executive director of Genesis, received recognition as Drum Corps International Directors of the Year in their respective classes during World Championships week this past August. Morrison became the 2013 World Class Director of the Year, earning the Dr. Bernard Baggs Leadership Award, named after the longtime judge and DCI Board of Directors adviser who passed away in 1998. The award is decided upon by a vote of all World Class directors. With six years as executive director and seven of involvement with the Crossmen organization behind him, Morrison said he feels very special to be recognized by his peers. "It's really humbling to be honored like this by your fellow directors," Morrison said. "They all represent such great organizations and are folks that we really look up to, so when they give us a nod, that's really special." Morrison said he knows that all of the directors and their corps work incredibly hard, and that success is in fact a product of working together. "This award really belongs to the entire Crossmen organization," Morrison said. "It belongs to all the volunteers and all the kids who have helped us make this thing a reality and keep it alive." From helping found Genesis in 2009 to leading the corps to a bronze medal and the Most Improved Open Class corps award in 2013, Chris Magonigal has poured his heart into the organization. "Being able to put together a staff that changes kids' lives is enough of an award," Magonigal said. "It's just awesome to see the lives and faces change over the years." Magonigal said receiving recognition from such a well-respected, accomplished group of directors is unbelievable. "With Genesis, we try to play our own rules and just do what we need to do," Magonigal said. "I hope this inspires people to take a step back and see that what they're doing is okay, no matter how big your corps or how high your score." 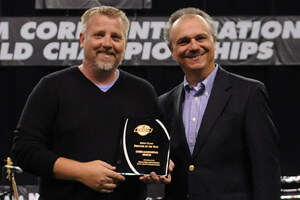 Also receiving a leadership award at the World Championships was Mark Stasa, a longtime advisor to the DCI Board of Directors. Stasa was honored with the 2013 George Bonfiglio Chairman's Award, presented to a person demonstrating extraordinary leadership, service and effort on behalf of DCI. The award is in honor of George Bonfiglio, DCI's first Chairman of the Board and an instrumental leader in the organization's early growth. Stasa, who currently practices as an attorney, has an extensive drum corps history, including marching and instructing. 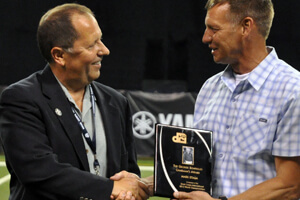 The 2012 DCI Directors of the Year were Chris Komnick of the Madison Scouts and Rick Odello of Blue Devils B. Mark Arnold of the Blue Knights was the recipient of the first-ever George Bonfiglio Chairman's award last year. Contributing to this report: Christina Mavroudis.